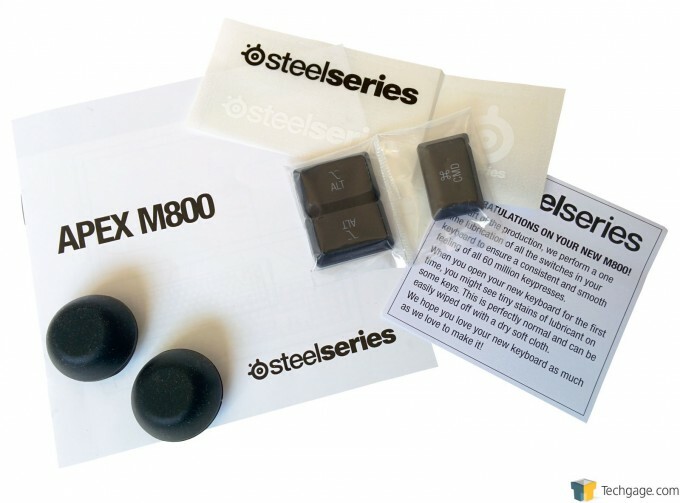 SteelSeries has always been a heavy hitter in the world of peripherals. With a slew of highly touted mice, keyboards, and headsets, it looks to take things to the next level with the Apex M800 illuminated gaming keyboard. Does it have another winner on its hands, or are thousands of gamer nerds wrong? Read on to find out. OK, it’s keyboard review time! I know… plastic plank, keys, a few lights. Boring, right? WRONG! 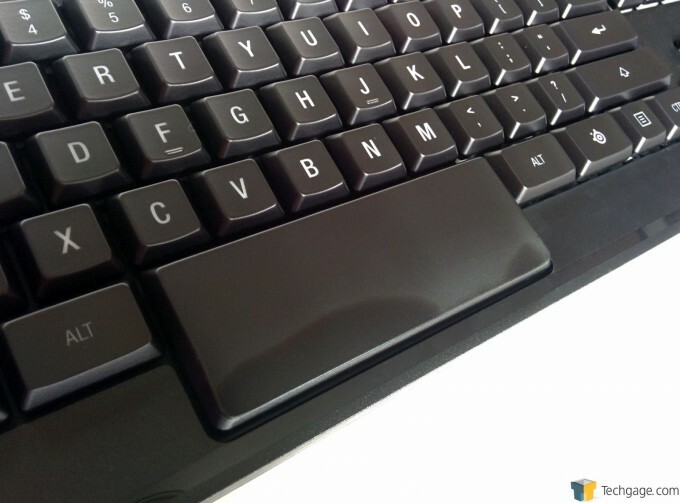 Today, we have SteelSeries’ Apex M800 illuminated gaming keyboard to take a look at. The M800 doesn’t go as far as some models that drown you in a plethora of niche options you may never use, and instead opts to offer gamers a rock-solid experience with core features that should make their gaming and non-gaming life a little bit easier. That’s not to say that the M800 is bland in terms of what’s available, but it just doesn’t throw the kitchen sink at you when what you really need is a bath tub. OK, I’ll stop with the terrible analogies. Sure, there’s the usual fare of n-key rollover and anti-ghosting, which we’ve seen many times before, but there’s also some surprises under the hood. For example the M800 sports dual processors that handle input and lighting separately, proprietary high performance switches, low profile keys caps, and some very cool illumination options, just to name a few. The original Apex took up a lot of desk space, but the M800 scales things down by shaving off 2″ from the width and another 2″ from the depth. 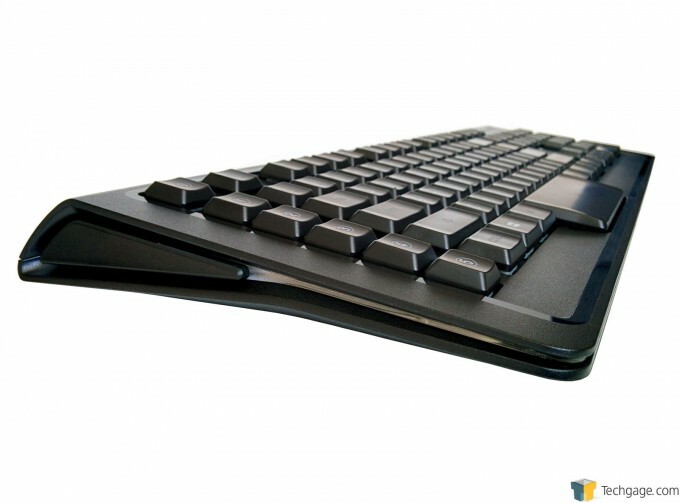 To achieve this smaller footprint, SteelSeries has removed the second bank of macro keys on the left side, four “layer” keys in the top left corner, another bank of keys above the F-keys, and the dedicated multimedia keys that ran down the right side of the first generation Apex. Over on the far left is now a single row of dedicated macro keys that have no function out of the box, but like all keys on the M800, can be customized via the SteelSeries Engine 3 software. They can be setup in a number of ways, a few of which are to act as a standard macro, to open an application, or even act as a shortcut to a mouse button. 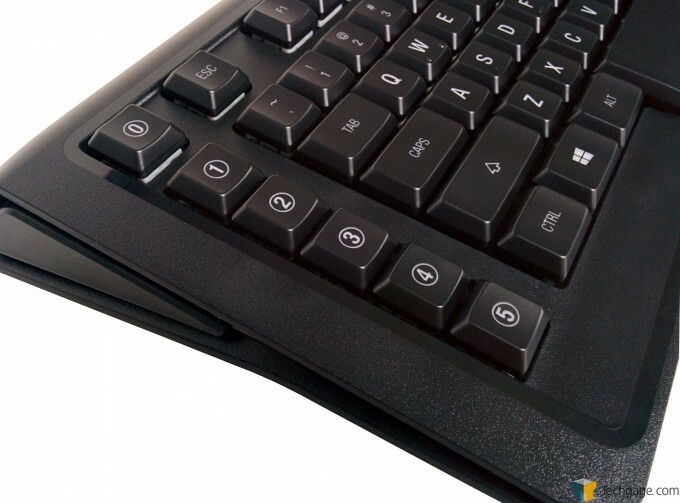 The large spacebar from the previous model returns on the M800, but it’s not quite as massive. When our review sample was initially removed from the box we thought that the spacebar showed some signs of use along the bottom edge, however there’s a small note included that states the keys have been lubricated and that some of this lubrication may be visible on the top side of some of the key caps. A quick wipe with a cloth and the spacebar was looking clean and ready to roll. 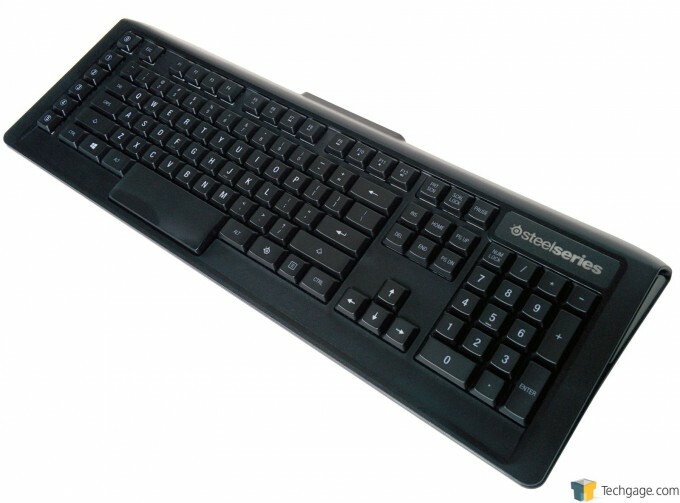 The rest of the keyboard layout is fairly typical with the exception of the function key that sports the SteelSeries logo to the right of the spacebar. This key can be used along with the F5 or F6 keys to brighten, dim or turn off the LED backlighting, or with the F7 through F12 keys to control media play back and volume levels. 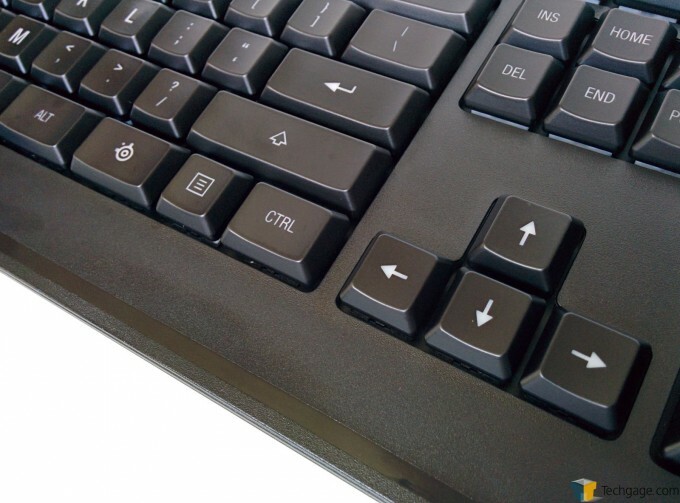 Users of the original Apex will notice that the diagonal arrow keys have been dropped, which may or may not cause a fuss depending on whether they were used in the first place. SteelSeries again chosen to go with the same low-profile wedge shape of the original, as well as the LED-lit side accents that provide a little bit of extra style for those who want it. Another returning feature is the two port USB2.0 hub. 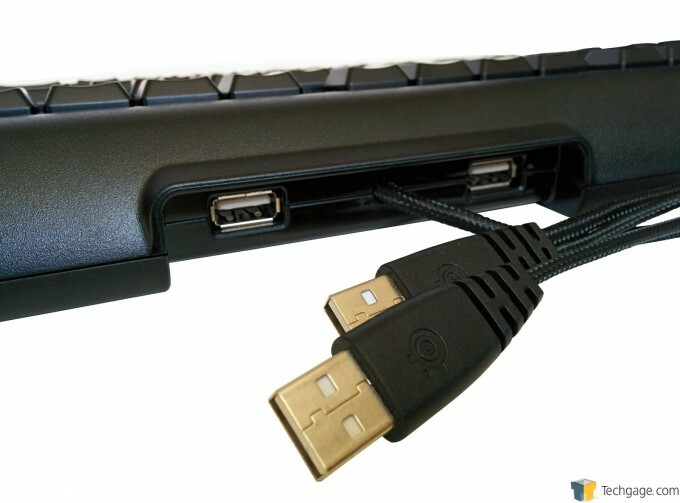 The ports are found on the top edge, flanking the braided cable that splits at the end with one connection for the keyboard, and the second for the hub. The belly of the M800 shows off the same low-profile rubber pads in each corner. 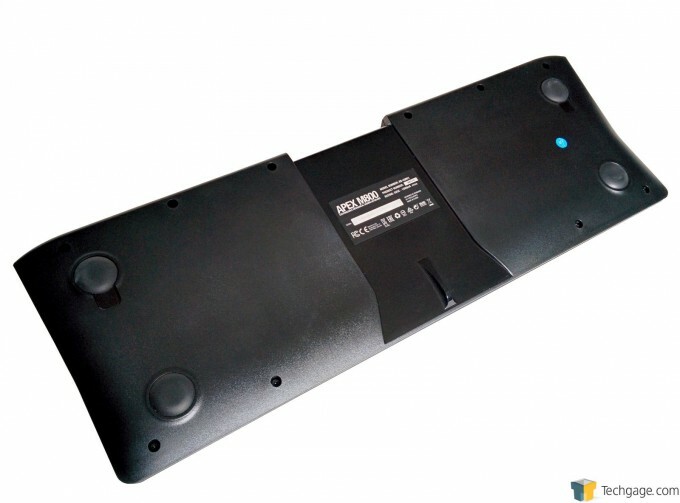 Like the original, the M800 comes with a set of thicker pads, allowing users to change the profile somewhat. In the center is a newly recessed channel that acts as a way to feed cables under the keyboard without affecting stability. Popping off one of the low-profile key caps gives us a look at the QS1 switch that has been designed through a partnership with Kailh, the same company who has helped developed switches for Razer and Thermaltake. The main benefit of these switches is the low amount of force required to press the key, which is on par with Cherry MX Red switches, as well as a shorter throw of 3mm compared to 4mm, and shorter reset distance of 1.5mm compared to 2mm found on the same Cherry switches. 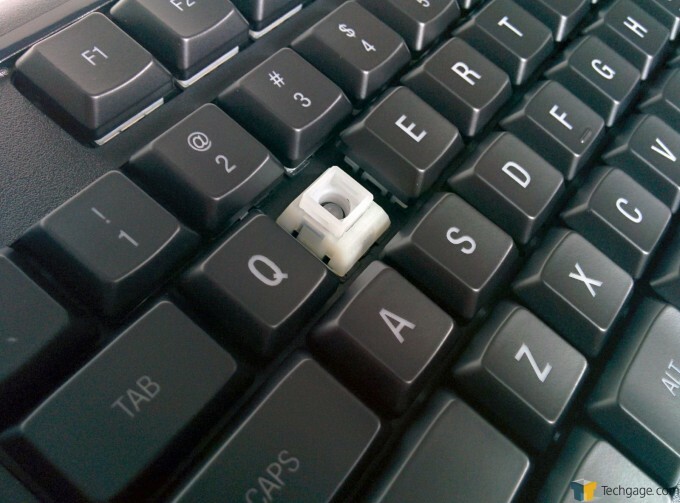 Good for 60 million clicks, these switches consist of a white slider with an open center that rests on a spring. The open center allows for individual LEDs to shine straight through the underside of the cap without any obstructions, resulting in bright, even backlighting. The slider is clipped onto the left and right sides of the base where the contact is found, and pressing a key causes the slider to hit the contact, resulting in a keystroke. Included with the Apex M800 is the small note regarding the posibility of the aformentioned lubrication stains (as awful as that sounds), a quick start guide, a set of replacement CMD and Alt caps for those who plan on using the M800 with a Mac, the thicker rubber pads used to prop up the keyboard, and a set of stickers to flaunt your peripheral allegiance.